"This is a wonderful recipe that can be made ahead and prepared easily. It's a wonderful and filling casserole that can be easily doubled for when you have company." See how to make delicious meatloaf in the slow cooker. Love this recipe.. I added zuchinni and yellow squash to try and get more veggies on my plate. Deffinately a keeper. I served this for dinner today, and it was a big hit with my very fussy family. 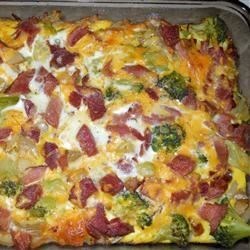 I highly recommend it for a casserole Saturday supper.